Gianni Freestanding Soaking Tub 67"
Name: Gianni Freestanding Soaking Tub 67"
Gianni Freestanding Soaking Tub Modern Cast Stone 67"
Convert your bathroom into the ultimate spa retreat with the luxurious Gianni modern bathtub. 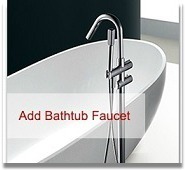 Its silky feel and satin touch will invite warmth and overwhelming relaxation into your bathroom home d?cor. Its unforgettable polished satin matte finish allows you to indulge in its beauty while resting on its smooth, rounded-edged rectangular shaped design. Bathtubs found in the market today are constructed by joining two sheets of fiberglass and leaving an empty hollow layer between the two fiberglass sheets. However, the Gianni modern solid surface bathtub is one solid piece made of crushed stone along with strong and durable molecular compounds and advance composite materials without gaps or hollow layers. The slick non-porous feature of this solid surface bathtub design works as a natural deterrent for bacteria adding hypo-allergenic and stain resistant properties contributing to the contemporary functionality of this chic yet timeless bathtub design. The elegantly pronounced curves gently dominate this one piece freestanding modern bathtub which comes equipped with a inconspicuous over flow cautiously positioned to avoid interfering with the trendy bathroom design. This freestanding bathtub will enchant you with its smooth velvety feeling and transform your bathroom home d?cor instantaneously. This magnificent solid surface stone bathtub decor undoubtedly introduces comfort, flexibility in design, and a soothing bathing experience into any bathroom home design.